This little booklet is intended to be a simple aid to living and praying in the Divine will as taught by Jesus to the Servant of God, Luisa Piccarreta. It is not a complete guide, but it is hoped that newcomers to this spirituality will find, in these simple lessons, a means of embracing and understanding Jesus’ invitation to live in the Kingdom of the Divine Will. The purpose of the Gift of the DW is to allow God to receive perfect glory from the whole human family, i.e. from Adam to the Last human to be created. From the moment he was created, Adam could give God a perfect return of love and glory in everything, all of the time, because he possessed the Gift of the DW. At the fall, Adam lost this gift and was then only able to correspond to God with his limited human capacity-not with the unlimited capacity of the DW which he previously enjoyed. place within Adam’s human will the Divine Will. The DW “resided” there only because Adam consented to this, allowing himself to be animated by God in every way: his thoughts, words, glances, steps, movements, breaths and heartbeats, etc. for this reason all of Adam’s acts were of a Divine Order because he was consenting to letting the Divinity do everything within him. It is because the divinity was doing everything in him that Adam’s acts were perfect, thereby giving perfect glory and perfect correspondence of love to the creator. This does not imply a lack of free will on the part of Adam. Instead, Adam was continuously consenting to giving the Divinity the freedom to “operate” in him in this way*. The human will is presented by Jesus as an empty glass in which the waters of the Divine Will reside. This was intended by God to be the permanent condition of man. The human will was not created to be isolated from the Divine Will. Up until the Fall, the DW operated in every aspect of Adam’s being. with the gift of free will Adam could empty himself, at any time, of this divine capacity to glorify God perfectly. In fact, he did empty himself of this gift when he took the forbidden fruit. *This does not mean that Adam was made divine. He was always a creature, but a creature consenting to letting the Creator animate him in every respect. It is important to remember that having desired the Gift after deciding to sacrfice one’s own will, that it is Jesus who does all the work. Only Jesus can do a divine act. We always remain creature. Everything should be now done with reference to Jesus because it is He who is doing everything within us-except error, i.e. sin. If we sin we would lose the gift of DW. This is because we obviously cannot make Jesus sin. If we make a sincere act of contrition then we can ask Jesus to return the Gift to us, and He will do so. If our sin was of a serious nature – mortal sin – then we would first have to go to the Sacrament of Reconciliation, and then ask Jesus to return the Gift to us. Remember that everything is achieved by the Golden Rule – we desire it and Jesus does all the work. Notice that Jesus did not say “think”, but “desire”. Thought alone will not do. It is the desire of the heart which ensures living in the Kingdom of the Divine Will. + We first desire to enter into Jesus and He brings this about by the ‘Golden Rule’. + Then we transform ourselves into Him (also brought about by the ‘Golden Rule’). As St. Paul said: ‘Put on Christ’, so we do everything as an other Jesus, since Jesus is doing everything within us: our thoughts, words, actions, steps, movements, breaths, heartbeats-everything except sin. + next, we take what we find in Jesus. Jesus explained to Luisa (Aug. 14, 1912) that while He was on earth, during His Hidden Life (i.e. up to the age of 30 years when his Public Ministry began), he took into Himself all the thoughts, words, actions – everything about everyone from Adam to the last person to be created, and He redid everyone’s life in his Divine Will. In this way there is a divine version of each one’s life. Why? – Because only the divine version can give God perfect glory – our human attempts at glorifying God, no matter how we become, would always fall short of absolute perfection. only on your own life, but also repeatedly with everyone’s life, Jesus wants you to do this for everyone’s life. Because Jesus redid the lives of everyone (from Adam to the last created soul) in His Divine Will then we can also pray, work, speak, walk, eat, sleep and enjoy ourselves, etc. in the name of everyone. as if everyone is praying in a divine way. 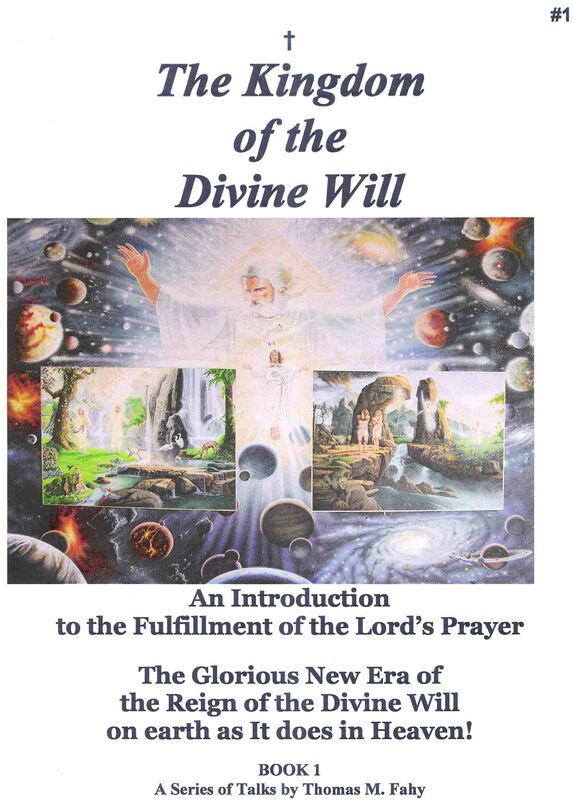 with just one prayer in the Divine Will because a divine prayer has infinite value, or merit, since it possesses the very dispositions and qualities of Jesus Himself because it is He who is doing all the work in His Divine Will. We can now pray the rosary, for example, in the name of everyone; and keep Jesus company in the Blessed Sacrament in the name of everyone, etc. so that God is receiving a perfect return of love and glory from everyone. Simultaneously in everything we do – providing we desire it! Remember the size of your prayer group, if you are praying in the Divine Will in the name of all, it’s everyone from Adam to the last created soul! her ‘I love you’ to Jesus on everything too, because Jesus would do it for her. And so we are invited by Jesus to do the same: to place our ‘I love you’ to Jesus on every created being/thing (past, present, future). These are the Rounds of Creation. We can place our ‘I love you’ on everything that Jesus said and did during His life on earth, including His resurrection and Ascension. These are the Rounds of Redemption. We should also place our ‘I love you’ on all the acts of the Holy Spirit, e.g. the sacraments, prayer, inspirations, graces etc. These are the Rounds of Sanctification. Jesus told Luisa to make these Rounds incessantly. united in My Will, and you will fill the heavens and earth with adorations, blessings, praises and thanksgivings in My Will. These are simple things easy and immense. Jesus made Mary the “Queen and Mother of the Kingdom of the Divine Will”. Mary was the third person (after Adam and Eve) to be given the Gift of the Divine Will (from the moment of her Immaculate Conception) Jesus, in His humanity, was the fourth Person to posses the Gift of the Divine Will. Next was Luisa Piccarreta and everyone after her who will say “Yes!” to His Gift. Our Lady gave Luisa 31 lessons* on the Kingdom of the Divine Will. With this Gift, what one would strive for in years can be accomplished in just one day! At night Our Lady also wants us to present all our acts of the day onto her maternal lap. This is to be done as soon as you awake, ‘at the break of dawn’ Jesus says, it is when you tell Jesus in your own words that you want everything today to be done only in His Divine Will. Jesus said to Luisa that the Kingdom of the Divine Will will not reign fully on earth until a certain number of Acts in the Divine Will have been completed. aware of what God wanted them to do and how He wanted them to be in their daily lives, they correspond as best they could to His Will. 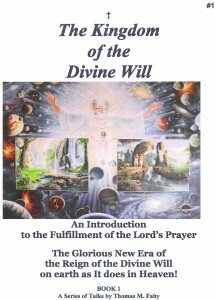 However, the gift of the Divine Will is not only about doing God’s Will, but possessing God’s Will, i.e. letting God carry out His own Will, Himself, within you through your consent. This is what Adam was doing up until the Fall, and what Jesus did in His Humanity throughout His whole life while on earth. Jesus points out to Luisa, who received the Gift of the Divine Will on Sept. 8, 1889, marks the beginning of the era of the Kingdom of the Divine Will on Earth. This Gift is now available to everyone. so Jesus came. Before leaving the earth Jesus gave another prophecy which He placed in the one prayer that He taught us: The Our Father. Divine Will. This is why there can only be agreement, peace, harmony etc. between Them. By the powers of the One Divine Will the Father is able to direct all His infinite love to His Son, and by the same powers of the same One Divine Will the Son is able to perfectly return this same infinite love to the Father. correspond to the father by the powers of the same one Divine Will which they both possessed. Divine Will. Thus, for each disciple to be one with Jesus in the same way as Jesus is one with the Father, would require the disciples to also possess the same one Divine Will as Jesus and the Father. And this is what Jesus prayed for the night before He died. – To think in my mind. – To circulate in my blood. – To look with my eyes. – To listen in my ears. – To speak in my voice. – To breathe in my breathing. – To beat in my heart. – To move in my motion. – To suffer in my suffering; and may my soul consumed and fused with your will be the living crucifix immolated for the Glory of the Father. – To infuse in me the faith of Mary most Holy in order to posses You as she possessed You to infuse in me the Hope of Mary most Holy in order to desire You as she desired You. – To infuse in me the charity of Mary most Holy in order to love You as she loved You. as if all had assisted at Holy Mass, and give to all the fruit of the sacrifice and impetrate salvation for all. Oh Most Holy trinity, Our Lord Jesus Christ taught us that as we pray we should ask that our Father’s Name be always glorified, that His Will be done on Earth and that His Kingdom should come to reign among us. In out great desire to make known this Kingdom of love, justice and peace, we humbly ask that you glorify your servant Luisa, the little daughter of the Divine Will, who, with her constant prayer and suffering, deeply yearned for the salvation of souls and the coming of God’s Kingdom in the world. Following her example, we pray to You, Father, Son and Holy Spirit, to help us joyously embrace the crosses of this world so that we may also glorify Your Name and enter into the Kingdom of Your Will. Amen.